Please be advised the on Sunday, November 17, 2013 our Executive Meeting will be held at 10:00am followed by our General Meeting starting at 11:00am. Every time you volunteer to help with a job, be it doing tickets, or helping with activities such as set up and clean up, you will be given a draw ticket to put in the barrel. Draws will be made on the 15th of each month and $25.00 in Legion dollars will be awarded to be spent as you would like. Contest open to all members. We are pleased to announce that as of September 3, 2013 we have updated our bar food menu. As per our members suggestions we have added a few items and most importantly lowered some of our prices. Our daily specials will now be changing every week with two options on Saturdays. EARLY BIRD RENEWAL STARTS SEPTEMBER 1ST. Join us on December 31/13 for our bringing in the new year dance and pot luck dinner. No money to pay for entry only a dish of your choice to add to the buffet table. Just write at the bar your name and the dish you are bringing so we all know what is already going to be on the buffet. Live Band expected RETROFIRE plays songs from the 60s to up to date, Enjoy the favorites of Elvis,Roy, Buddy Holly and Neil. Party favors and extra so come on down bring your special someone or just yourself and have a great time with us. This is a special one not only a chance for you to have your say on what you would like to see happening at our Legion but find out how you can get involved. This meeting is not only a welcome after our summer away but also a Honors and Awards meeting. All members welcome and join us after as the bar will be open and a light snack is served. We look forward to seeing not only our usual members but also some of the new ones that joined us during the summer months. Drop in to try out your voice with hits old and new or just have fun dancing and listening to the music. Congratulations to our Membership Chair, Comrade Carol Fontaine because of her hard work and dedication we are now in receipt of the BRONZE MEMBERSHIP ACHIEVEMENT AWARD. 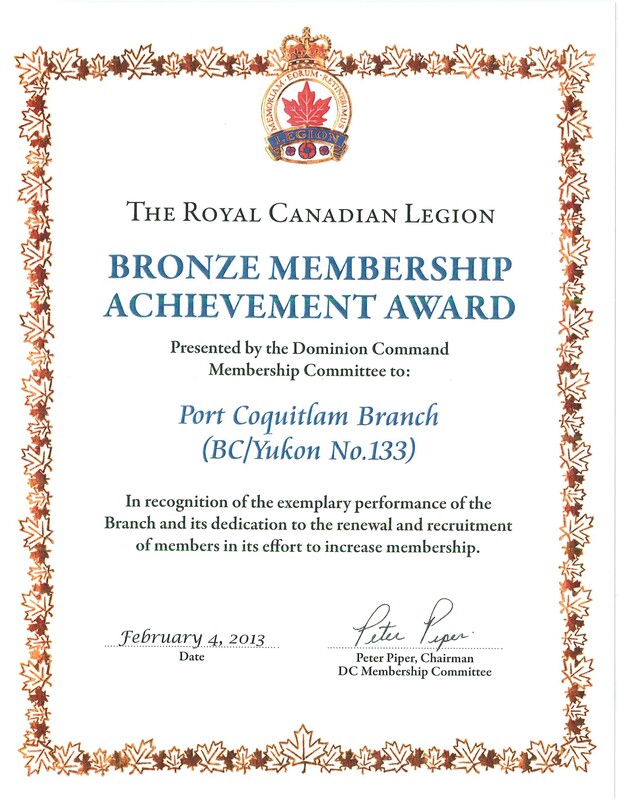 This award has been presented to our branch by Dominion Command. Thank You Carol for your many hours of volunteering in order to achieve this. Comrade Andrew Carroll was elected to the position of President of the Royal Canadian Legion, Port Coquitlam Branch #133 taking office on January 1, 2013. He also serves as the Service Officer for the Branch. Andrew is married to Judith and has four children and six grandchildren. He has been a resident of Port Coquitlam since 1981. His tenure at Branch #133 has been for only 3 years. Comrade Carroll was with the Air Force Association of Canada for a number of years and was the Founding President of 801 Wing (Vancouver) leading the organization for six years prior to retiring in 2006. He served in the RCAF for a period of seven years in the late 1950’s as a Public Relations Specialist. When he left the Air Force in 1962 he moved to Vancouver. Andrew retired from a long career in B.C. Trucking and Business Consulting in 2012. Comrade Carroll also volunteers with the RCMP Community Policing and with his church, Trinty United in Port Coquitlam. Welcome to Port Coquitlam 90th anniversary May Day Festival. It was in 1923; 90 years ago that Port Coquitlam celebrated its first community May Day Festival. Since it’s beginning this festival has focused on families and the community at large. Port Coquitlam’s May Day Festival is time for our community to gather, contemplate and applaud an event that makes us all proud. Leading the Parade; as in years past, is the Royal Canadian Legion Port Coquitlam Branch #133. The Legion Is located beside the Shaughnessy Street underpass. 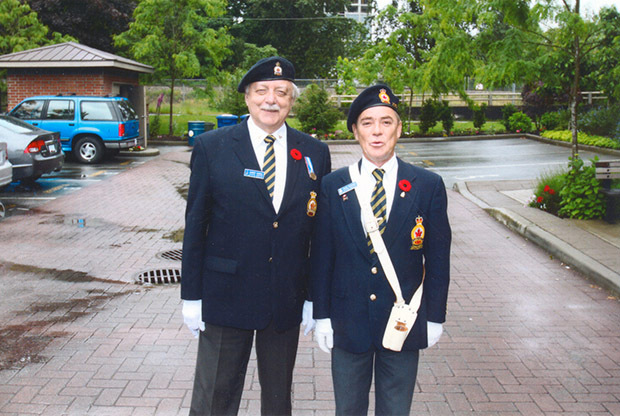 In 2008, the legion completed the building of a 54-unit seniors & veterans residence, RJ Kent the Residence. The Legion contingent is lead by the Port Coquitlam Legion Pipe Band. They are followed by the Legion Colour Party. Next are our cadets. Boys and girls aged 12 to 18 years. The Seaforth Highlanders Army Cadets and their marching band. Then the Air Cadets of the “777” Neptune Squadron also accompanied by their band. These cadets are involved in community service, personal skills development and physical recreation. Their main activities take place at the Legion Cadet Hall and can often be seen parading in the rear parking lot. As many of our veterans are unable to march the distance they now Parade in golf carts. These veterans served their country in W.W.II, Korea and Afghanistan. We have a very special guest in our Legion contingent. Her name is Alice, she was born in 1913, the same year as our great city. Alice was invited to join us in this celebration of Port Coquitlams 100th birthday and this the 90th May Day Festival.